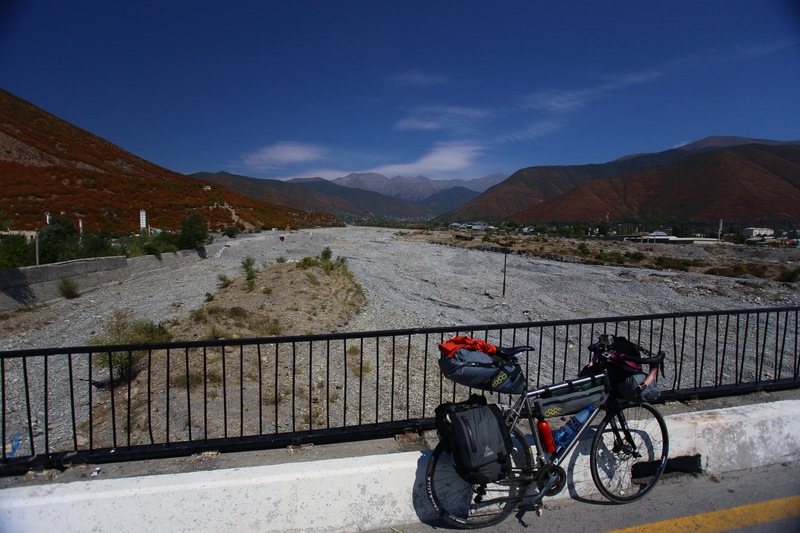 As I started my central Asian section of the ride I really wanted to push lightweight touring even further and drop the panniers completely. I have my Apidura bar bag, Apidura frame bag and I have now added the Apidura saddle pack. Sadly I failed and I also have two part filled panniers. 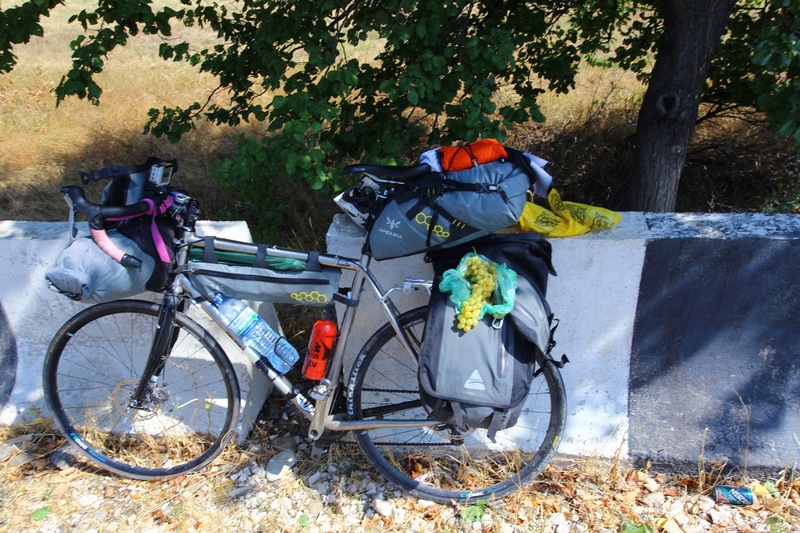 I could take one but the bike would be out of balance and in the Kazakh and Uzbek desert I will need to carry up to 8l of water and a few days food so that is why they stay. 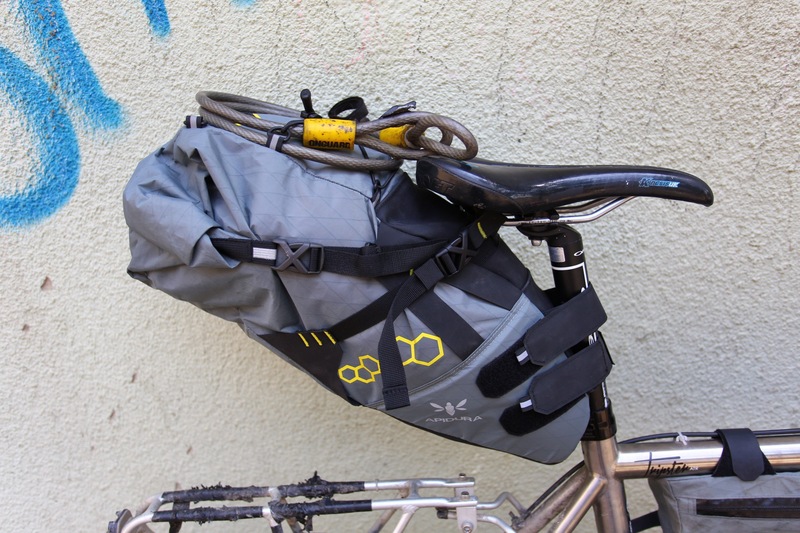 Here is a close up of the awesome Apidura saddle pack in action, so far I don’t have a bad word to say about it. Fits well, stays stable when riding and fits stuff in it like a tardis. Five spare tubes and three patch kits! They’re hard to find here! Spare food and toothbrush/paste squeezes in too! 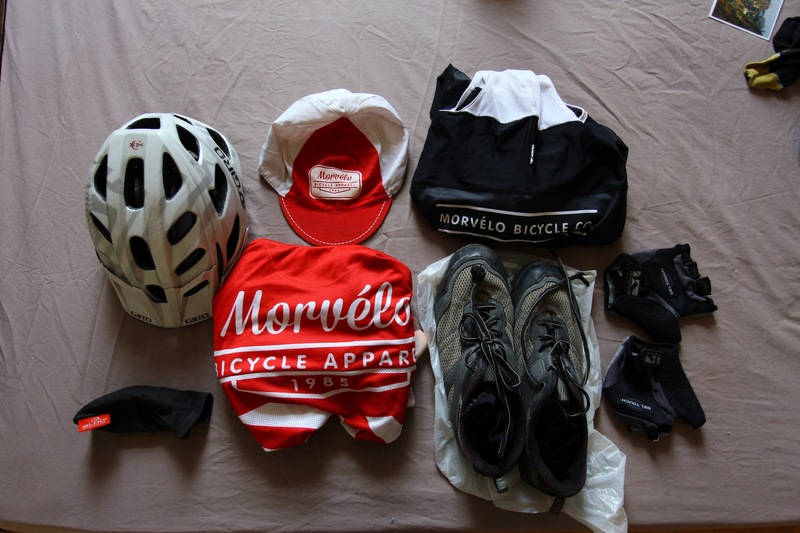 Finally this is my normal riding kit, I now have just one Morvelo kit, its going to smell bad but it’s light! I also have the same Ortleib camera bag on the bars for my DSLR and lens. I really couldn’t decide whether I should just lose the panniers and squeeze it all in but being on my own the spare space is nice. After the Uzbek desert I will need warm clothing for the high mountains, so the water space will be used up with thermals. It also gives me a plan ‘b’ if a bag breaks in the middle of nowhere. What changes did I make to the kit? I swapped our 2.3kg 2 man tent for 900 gram solo tent. Carrying stove and first aid kit from marion add weight. No longer have the spare Morvelo kit nor spare T Shirt nor the Gillet. 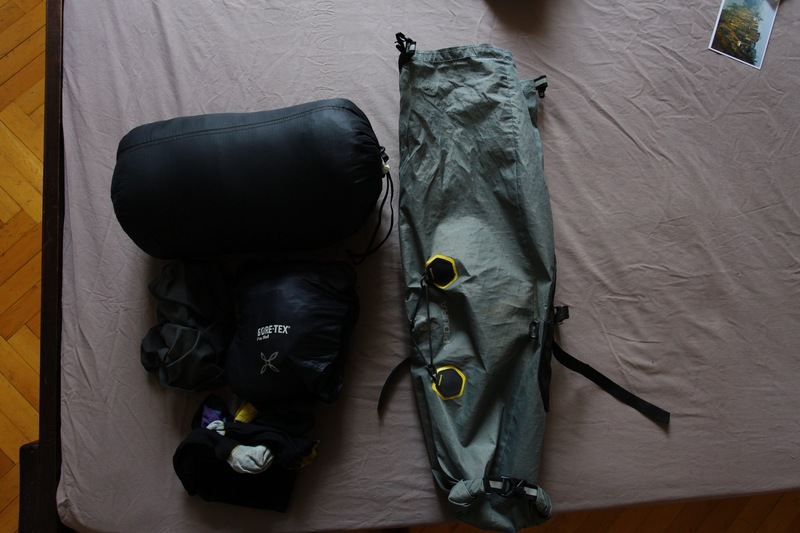 I have Marion’s epicly warm and lighter Mountain Hardware sleeping bag. The new sleeping mat is heavier than the Karrimor X Lite but it still holds air unlike the Karrimor! I lost the big camera tripod and some extra batteries, I also ditched the solar panel to save weight. 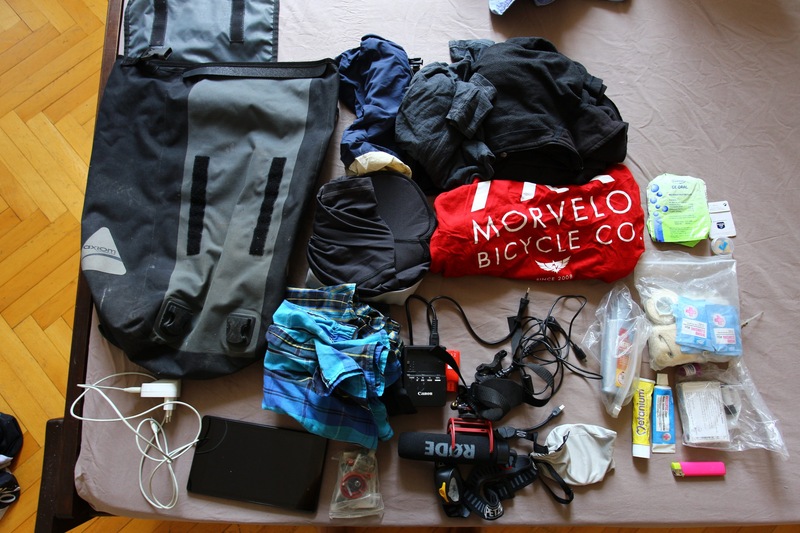 With Marion gone and no one to share kit with the weight I am carrying still feels pretty good, I have ditched kit but not sacrificed on safety as I head into some remote and unknown countries and landscapes. It is going to be an interesting adventure that’s for sure!! Thanks, I used the largest bag size, the regular I think it’s called. I used the largest size for all the bags they make. 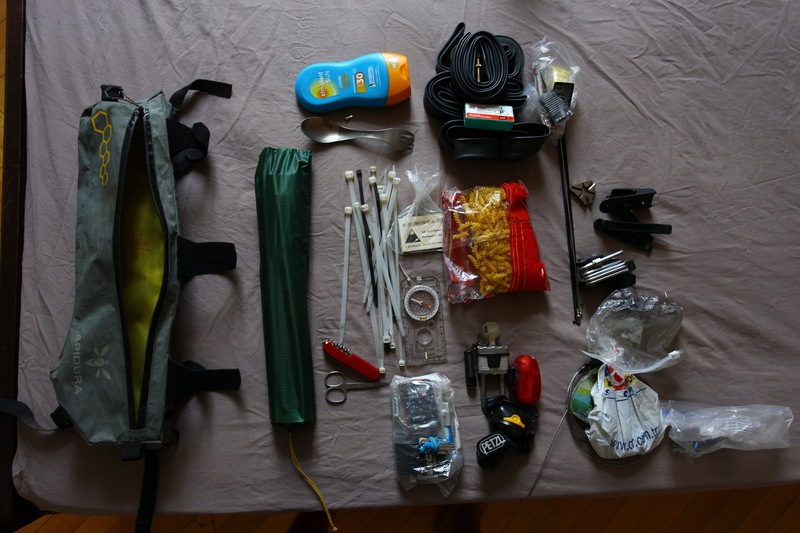 This may sound stupid – but can you possibly do a video showing how you get your stuff into the seat pack? 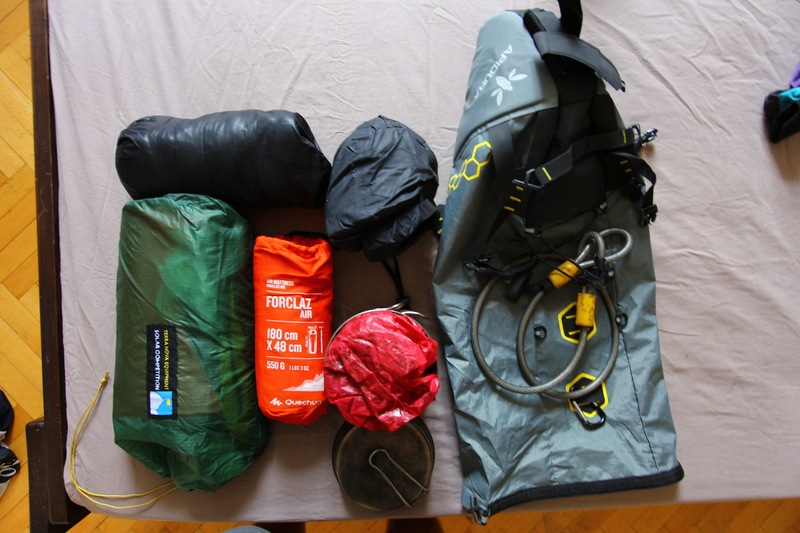 I am looking at the gear that is to go in and seeing everything in stuff sacks/compression bags and wondering how you manage to get it to sit nicely within the seat pack without lots of empty space? You’re right that there is a certain technique I have developed for packing kit over the years of bike packing. 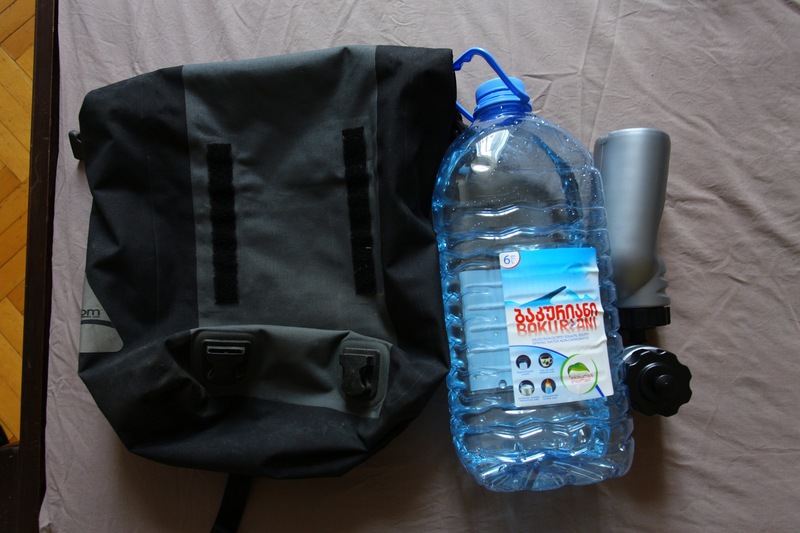 The saddle bag must be pretty much full and ideally have something with structure inside. I like your video idea and I will put something together and on the blog! However as a quick overview, put compactable clothes in first to fill the end of the wedge near the seat post as this needs to be full and solid, then put bivvy bag/tent and roll matt in as these add structure. I then slide clothes around these to fill it up so it doesn’t move about. Then close it and pull all straps as tight as they go.